Many of us are now facing some difficult choices concerning our aging parents. Should they stay in their own home as long as possible? Should they move to a facility for the aged? Should they move in with us? Each of us will have our own unique conditions to consider when making this decision. If the answer to the question is, they will move in with us, I have some suggestions as to the best course of action. Ideally, your parents can have their own space separate from your family’s living area. In most cases this would be accomplished by adding a parent’s wing addition to your home. If the addition does not have a kitchen, and fits within the building envelope, then there is no need to involve the local zoning office. If there will be a kitchen with a cooking range, then zoning will have to review your application for approval. Zoning will approve an addition with a kitchen only for a related parent because most residential zoning does not allow renting space to unrelated persons. 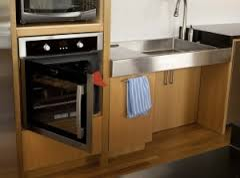 If and when your parents are no longer living with you, the zoning department will, at a minimum, require removal of the cooking range to be in compliance with the single family zoning regulation. Your budget may dictate that you only build a bedroom, closet and handicap bath addition due to the extra expense of a kitchen and living room, and you will share some common areas in your home, like the kitchen and living room. Financial considerations have a big impact on what course of action we take. Considering the high expense of an elderly assisted living facility (40-60K per year), it may be more cost effective, and a good investment, to build an addition and have your parents close by. This may or may not be a good solution, depending on what kind of relationship you and your family have with your parents. You, or possibly another family member, may want them as far away as possible, or at least at arm’s length. Ah yes, the trials and tribulations of family relationships can be daunting, to say the least. On the flip side, if everyone gets along, it can be a very rewarding experience to have our parents close by. Now that we are over the regulatory and financial hurdles, the next issue to consider is design and how to make the addition an esthetically pleasing part of your home. There are also accessibility requirements to include in the design. Even if your parents are now mobile, it is wise to prepare for possible wheelchair access to the addition, and from the addition to your living area. This will require a ramp with maximum vertical rise of 1” per foot of horizontal run. Doorways should be at least 32” wide, and whenever possible, 36” wide with at least 18” of clear space on the knob side of the door. Exterior door thresholds should be no higher than about ½”. Hallways should be 48” wide. The bathroom can be a dangerous place for an elderly person. Grab bars should be installed around the toilet and in the shower. 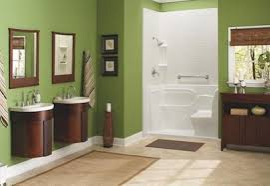 The best bathing option is a shower with a floor that is just about level with the bathroom floor, and large enough for a wheelchair and a bathing bench. 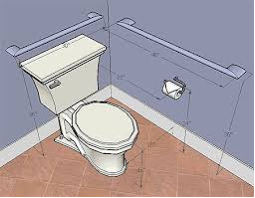 The toilet should be 2” higher than a standard toilet, and there should be a 36” space next to or in front of the toilet, making for an easier transfer from a wheelchair. The sink should be open underneath for wheelchair leg space. Light switches should be placed lower and electric outlets installed higher than standard so they can be easily reached from a wheelchair. Good lighting is a must to prevent falls and to facilitate the performance of everyday household tasks. 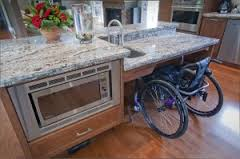 In the kitchen, countertops, sinks and cook tops should be lower, and dishwasher and ovens raised up for wheelchair accessibility. In addition, there is an amazing variety of special cabinetry and shelving made for handicapped accessibility. As in the bathroom, lots of lighting is a must. Of course, you can simply engage the services of a qualified aging in place contractor, like Plumb Construction, and all of the above requirements will be taken care of for you. Let us sweat the details. Bottom line is that your aging parents can continue to have a good quality of life in their golden years, and you will be close by so you and your family can enjoy their company, and be there to help when needed. Keeping your parents fully engaged in life as they age can only lessen the negative effects of getting old. Another benefit would be that this space could be used by any family member that is temporarily in need of accessible living space, say for an illness or broken bone. Friends and acquaintances with disabilities will also be welcomed in your home. Oh, and by the way, even though you may not want to think about it, consider that you may be able to use that handicap space yourself one day, and one of your kids may be living in your home to be nearby when help is needed.